Below deck on the SSV Normandy, Commander Shepard can talk to Garrus Vakarian, her turian sniper ally and future BFF. He was a cop once, he tells her. He butted heads with his superiors over his unorthodox methods and eventually quit the force, fed up with the bureaucracy and politicking. Anti-establishment sentiments like Garrus’ are popular in the Mass Effect trilogy. Captain Bailey, a mostly upstanding cop, will buck the system if it’s more convenient or rewarding for him. Jacob Taylor, ex-military, joined the private sector after becoming disillusioned with the army and its restricting red tape. Even the Council, the governing body of civilized space, employs Spectres, warrior-diplomats who operate outside the law. Mass Effect tries hard to sell the idea that its galaxy is a chaotic and lawless place, that rules and regulations obstruct, rather than enable, the implementation of justice. But it’s much more morally upstanding than it claims. Throughout the trilogy, Shepard can favor either the slow and steady organized justice disdained by Garrus and his ilk or the swift, efficient vigilantism they prefer. This is manifest in-game as the option to play as either a Paragon—a by-the-book tattletale—or a Renegade—a loose cannon who gets results. Mass Effect constantly insists that the Milky Way needs a Renegade, someone with a firm hand and steady aim who can violently tame the savage frontier. In practice, though, goody-two-shoes Paragon Shepard is almost always right, and comes across not as an uptight pencil-pusher but as a borderline prescient paladin. In fact, over the entire trilogy, Paragon Shepard’s approach is really only wrong once. Early in Mass Effect 3, it’s possible to run into Kelly Chambers, Shepard’s yeoman from the previous game, aiding refugees on the Citadel. While catching up, Kelly lets slip that Cerberus, her borderline terrorist ex-employers, are searching for her. 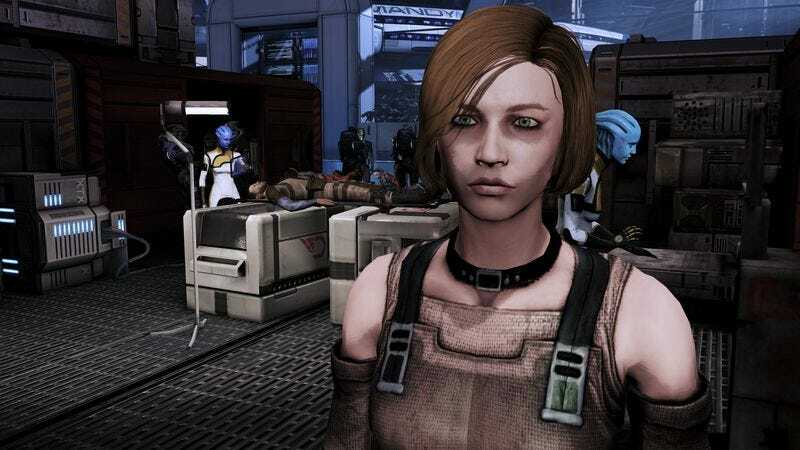 Shepard is given a simple dialogue choice: The Paragon option encourages Kelly to continue her work with the displaced persons; the Renegade option orders her to change her identity and go into hiding. Players who have been exclusively playing Paragon without consequence since the beginning of the series might be shocked to learn that this Paragon option gets Kelly Chambers killed. When Cerberus invades the Citadel—crossing the line from “borderline terrorists” into “terrorists”—they seek Kelly out by name and summarily execute her for betraying them. For the very first time in the series, choosing a Paragon option has truly negative repercussions. In this moment, the galaxy is actually as ugly and unforgiving as Garrus and the others who share his cynicism always insist it is. Up to this point, adhering purely to Paragon options has only ever been rewarded, even if, at the time, the available Paragon choice seems short-sighted, naive, or morally dubious. Choosing to free, rather than kill, the captive queen of a dangerous spacefaring insectoid species results in that one-time scourge of the galaxy becoming valuable allies in Mass Effect 3. A batarian terrorist can be permitted to walk free as you instead choose to rescue his hostages, and not only does he not cause any more trouble if allowed to live, but he can later be convinced to commit ships to Shepard’s fleet. When asked to either reprogram or eradicate a sect of the robotic geth, choosing to spare their lives will reward Shepard with loyal soldiers-in-arms in her fight against the genocidal Reapers—nobody questions whether she had the moral right to commit what is essentially mass brainwashing. Given how often Mass Effect coddles Paragon Shepard, it’s a wonder Garrus and the like ever managed to become so pessimistic in the first place. Mass Effect’s betrayals and revenges seem to happen offscreen or to people who aren’t in Shepard’s gang. When Shepard forgives characters, they are genuinely repentant; when others makes her a promise, they can be counted on to keep it. So long as players continually select Paragon options, her trust and faith in people will always be rewarded, and nobody who lies to her will ever get away with it. That’s why Kelly Chambers losing her life to the selection of a seemingly benign Paragon dialogue choice is so shocking. For the first time in the series, Paragon Shepard is not a saintly warrior-poet whose every decision is ethically and practically airtight. Suddenly, she’s a naive rube whose unfounded optimism got her friend killed. Mass Effect’s morality system isn’t supposed to be about choosing between good and evil but between Lawful Good and Chaotic Good, molding Shepard into either Dale Cooper drinking black coffee in the Milky Way or Dirty Harry Callahan with an M-6 Carnifex instead of a .44 Magnum. Its pampering of Paragon Shepard, though, makes it more like a choice between being right and being a jerk for no reason. If more Paragon options had led to Shepard’s trust and optimism being betrayed, had the galaxy actually been as unforgiving as everyone in it claims, it would have given every decision much more gravity. Would Paragon purists still be willing to free the captive rachni queen if she returned the rachni to their historical warmongering? Would they let that batarian walk free in order to rescue a dozen people if there was a real chance he would use his freedom to kill hundreds? It would obviously be overkill for every Paragon option to blow up in Shepard’s face, but by allowing Paragons to stroll infallibly through the galaxy, Mass Effect defangs a world it spends a lot of time insisting will bite.